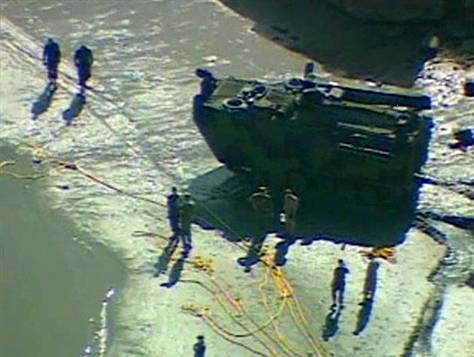 One Marine was killed when the amphibious assault vehicle he was riding in became submerged under water in the Del Mar boat basin during a training exercise here today. Marine was one of six in a training crew inside the vehicle when it flipped or capsized about noon (3 p.m. ET) at the Del Mar Boat Basin at Camp Pendleton, officials said. The incident happened at approximately 11:30 a.m. just north of Oceanside Harbor. The Dead Marine was recovered at approximately 2:15 p.m. and transported by Mercy Air to Scripps La Jolla where he was pronounced dead at 2:47 p.m. It has was reported that six Marines were in the vehicle during the incident. Five Marines were pulled out earlier and three of them were rushed to hospitals. Their conditions were reported as released or about to be released healthy. Marines routinely train in amphibious assault vehicles at the Del Mar facility, officials said. Each vehicle usually is occupied by a crew of three plus an instructor. According to a spokesperson with the 15th Marine Expeditionary Unit, search and rescue crews had pumped oxygen into the vehicle to increase the chances of the Marine's survival. “Unfortunately, we were unable to recover the Marine in time,” said Maj. Daniel J. Thomas. “To the family, our condolences go to them, on behalf of the Assault Amphibian Battalion and obviously all the Marines here at Camp Pendleton,” Thomas said. The incident resulted in an urgent military-civilian rescue and recovery effort. Lifeguards and a dive team were among the civilian crews aiding military personnel in the emergency, according to Oceanside Police. The name of the deceased is being withheld until 24 hours after notification of next of kin. The training vehicle, which moves Marines between ships and shore, was part of the Amphibious Assault Vehicle Schools Battalion, KNSD said. Thomas described the vehicle as 32 to 36 tons, introduced in 1972, and made to travel on land and under water. Besides a driver and instructor, they can carry an additional 20 Marines. “For them this is their initial driver training in the water at the basin controlled environment before they go into the open ocean,” Thomas said of Marine training. “The vehicle is never operated alone. We always have two vehicles that go out so it can have a chase vehicle with it. So we had two vehicles in the water so that if something does occur, another vehicle can respond. Those procedures were in place and being followed,” Thomas said. Marines were not placing a hold on training, he said. reports that come, lessons learned in terms of preventing anything like this from happening,” he said. The vehicle called an Amtrac or hog is a seafaring tank armed with a .50-caliber machine gun and a grenade launcher, the San Diego Union-Tribune said. After leaving a ship, the vehicles often drop below the surface before they pop above water. They travel about 8 miles per hour on water and 45 miles per hour on land with as many as 24 fully loaded combat Marines into battle. The vehicles are not the same as the Expeditionary Fighting Vehicle, which the Marine Corps tested at Del Mar basin, the North County Times said. Last week, Defense Secretary Robert Gates canceled EFV development in a Pentagon cost-cutting move.